RAFT would like to say a huge thank you to Iver Golf Club, who have announced that RAFT will be their chosen charity for 2017. An official announcement was made to members at their AGM, during which a cheque for £380 was presented to RAFT’s Operations Manager, Richard Ellis. RAFT are extremely grateful to Iver Golf Club for selecting it as their chosen charity and for the support they have given the charity for a number of years now. 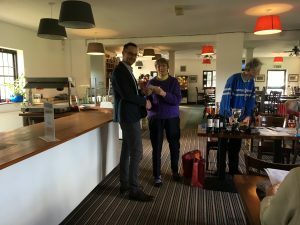 A special mention must also go to club member Bob Jenkins, who was in attendance at the AGM and is in the final stages of preparation for the London Marathon. Bob turned 80 last year and this will be the 20th marathon which has run for RAFT- truly remarkable. RAFT would like wish Bob the best of luck for the race and say thank you again for everything that he has done for the charity.